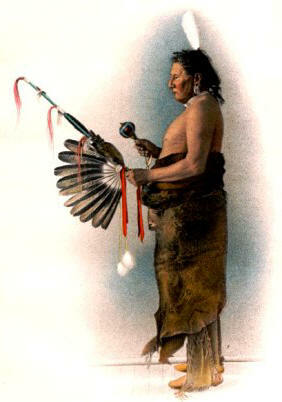 The Medicine Lodge originated among the Algonquin tribe, and extended gradually throughout its branches, finally affecting the Sioux of the Mississippi Valley, and forming a strong bulwark against the work of the pioneer missionaries, who secured scarcely any converts until after 1862 following the subjection, starvation, and imprisonment of many Native Americans. The order was a secret one, and in some respects not unlike the Free Masons, being a union or affiliation of a number of lodges, each with its distinctive songs and medicines. Leadership was in order of seniority in degrees, which could only be obtained by merit, and women were admitted to membership 66 upon equal terms, with the possibility of attaining to the highest honors. No person might become a member unless his moral standing was excellent, all candidates remained on probation for one or two years, and murderers and adulterers were expelled. The Grand Medicine Lodge consisted of two very large tepees that were pitched facing one another, a hundred feet apart, half open. The tepees were in close vicinity or connected by a roofless hall or colonnade of fresh-cut boughs. One of these lodges was for the society giving the dance and the novices, the other was occupied by the "soldiers" whose duty it was to distribute the refreshments, and to keep order among the spectators. They were selected from among the best and bravest warriors of the tribe. Peace Treaties were negotiated at the Grand Medicine Lodge. The Kansas Medicine Lodge Peace Treaty was made on October 21 1867. The Pow-wow was attended by over 5000 Native Americans from the Cheyenne, Arapahoe, Comanche and Kiowa tribes. The Medicine Lodge society used of all curative roots and herbs known and were taught exhaustively and practiced mainly by the old, the younger members being in training to fill the places of those who passed away. A medicine or "mystery feast" was not a public affair, as members only were eligible, and upon these occasions all the "medicine bags" and totems of the various lodges were displayed and their peculiar "medicine songs" were sung. The food was only partaken of by invited guests, and not by the hosts, or Medicine lodge making the feast. The "Grand Medicine Dance" was given on the occasion of initiating those candidates who had finished their probation, a sufficient number of whom were designated to take the places of those who had died since the last meeting. Invitations were sent out in the form of small bundles of tobacco. 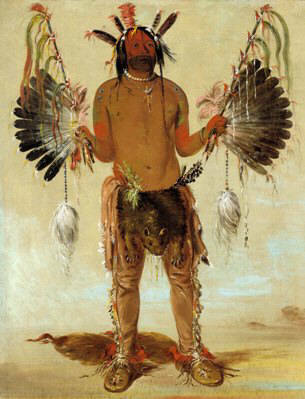 The preparations being complete, and the members of each lodge garbed and painted according to their rituals, they entered the hall separately, in single file, led by their oldest man or "Great Chief." Standing before the "Soldiers' Lodge," facing the setting sun, their chief addressed the "Great Mystery" directly in a few words, after which all extending the right arm horizontally from the shoulder with open palm, sang a short invocation in unison. This performance, which was really impressive, was repeated in front of the headquarters lodge, facing the rising sun, after which each lodge took its assigned place, and the songs and dances followed in regular order. After silent prayer, each medicine-man in turn addressed himself to his charge, exhorting him to observe all the rules of the order under the eye of the Mysterious One, and instructing him in his duty toward his fellow-man and toward the Ruler of Life. All then assumed an attitude of superb power and dignity, crouching slightly as if about to spring forward in a foot-race, and grasping their medicine bags firmly in both hands. Swinging their arms forward at the same moment, they uttered their guttural "Yo-ho-ho-ho!" in perfect unison and with startling effect. In the midst of a breathless silence, they took a step forward, then another and another, ending a rod or so from the row of kneeling victims, with a mighty swing of the sacred bags that would seem to project all their mystic power into the bodies of the initiates. Instantly they all fell forward, apparently lifeless. With this thrilling climax, the drums were vigorously pounded and the dance began again with energy. After a few turns had been taken about the prostrate bodies of the new members, covering them with fine robes and other garments which were later to be distributed as gifts, they were permitted to come to life and to join in the final dance. The whole performance was symbolic of death and resurrection. This information about the Medicine Lodge is featured in the book entitled The Soul of the Indian by Charles A. Eastman (Ohiyesa), published by Little, Brown and Company, Boston, 1911.